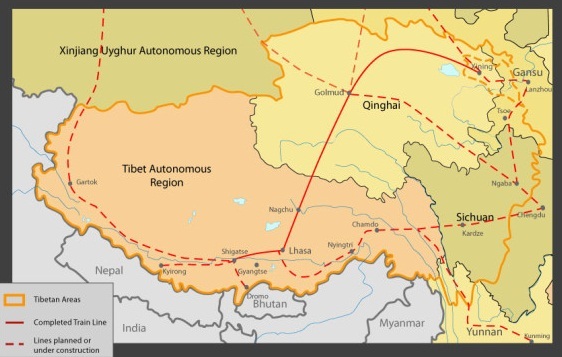 (TibetanReview.net, Mar06’16) – After talking about it for years, China has formally included in its new five-year plan a project to build a second railway line to connect Tibet with China. The railway will be built between Tibet Autonomous Region’s capital Lhasa and Chengdu, capital of Sichuan Province, according to the draft outline of the 13th Five-Year Plan (2016-2020) on national economy and social development submitted to the national legislature for examination, reported the official Xinhua news agency Mar 5. Tibet is currently connected by railway with China by the Qinghai-Tibet Railway. The 1,956-km railway started operation in Jul 2006. The new railway will be about 1,629 km long, and it will only take 15 hours for trains travelling between Lhasa and Chengdu, the report said. China will accelerate construction of railways in border areas and build cross-border corridors, the draft plan document was cited as saying. Another Xinhua report Mar 3 said China will carry out hundreds of programs and projects of scientific, economic and political significance in the upcoming five years. These included, in a list of 60, the proposed Sichuan-Tibet railway, big reservoirs in Tibet and other areas, and ecological restoration of Qinghai-Tibet Plateau and other ecologically important areas. Besides, projects like 30,000-km new expressways, New hydro power plants with an aggregate capacity of 60,000 mw, Expanded oil and uranium storage, Water diversion projects, Harnessing projects for 244 rivers, Urbanization of 100 million people in central and west China, Smart cities and sponge cities, 5 million km of rural road, and so on have obvious relevance to Tibet.